Home › ModernTribe's Blog: Modern Jewish Life & Style › Do you Vazu? My customers are the most wonderful people -- they call me to chat and tell me interesting insights they have about Judaica and Israeli design. Yesterday a woman told me about Vazu by Israeli designers T.H.+E. Design Group. I immediately loved the product and the concept and want to add it ModernTribe ASAP. Let me tell ya about them. 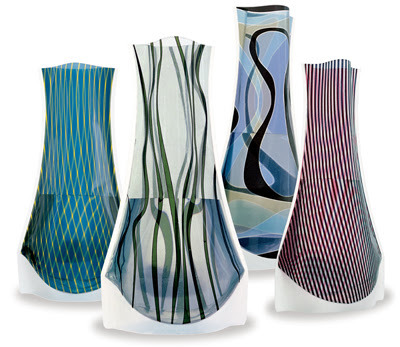 They are pretty, modern-design vases, right? They are actually made of plastic and fold flat for storage and travel. I don't know the price point yet but my customer told me it is pretty reasonable. Wouldn't they be great to bring along with the flowers you are giving to your girlfriend or hostess? How many times have you carted a glass vase with you and had to worry about it breaking in the car? Below is how they are merchandised. Unassuming packaging which looks more like pantyhose than a designer vase. I'll let you know when the are available at ModernTribe.com. Here is the url to the distributor in Canada. Email him and I bet he can point you to a Canadian retailer. Good Luck! Thank you so much, following your recommendation I have contacted Adama Design, and now 5 Vazu Vases are on their way to me!!! Thanks again. We’ve got them! I finally tracked down the US distributor. 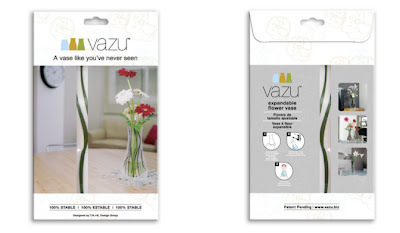 Vazu will be on ModernTribe.com next week and they sell for — get this — $9.99. Woo Hoo! 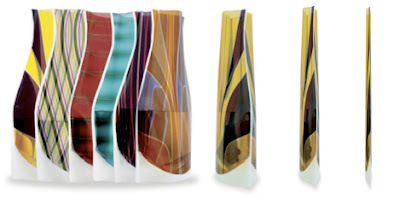 Does anyone know Where can I buy these Vases in Vancouver, Canada Area?